This addition to the growing series of battlefield guides has been written by Michael Stedman, author of Thiepval. 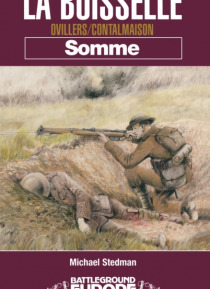 Drawing upon the wealth of material available in both national and local archives, documentary evidence, personal reminiscence and British and German unit histories, La Boiselle will add enormously to the experience of any visitor to this extraordinary location on the Somme battlefiel… d.This distinctive volume has ample detail to satisfy the discerning expert whilst retaining the accessible style which will ensure that anyone new to these magnificently informative places will feel at home with the text. Apart from the historical detail, La Boiselle is illuminated by a distinctive and detailed array of maps and aerial photographs which will guide the reader both at home and in the field. To support the maps a sequence of contemporary and comparison present-day photographs will enable students to plan and execute a series of enjoyable, informative and evocative tours through the locality. These walks will guide people to little-known sections of still existent front-line and assembly trenches, dug-outs, gun-pits and observation posts, past the memorials and cemeteries, with an eye for detail as well as to the human and personal experience of the conflict. If you are researching the story of a family member who served or is commemorated here, if you wish to deepen and illuminate a visit to a new Western Front location, if you are a student of the battlefield and the military tactics employed here, La Boiselle will add enormously to your knowledge and understanding of this powerful place. In an unsentimental manner, La Boiselle can transport you back across eight decades to understand something of the experience of the Tommies and their German counterparts who fought and died here during the Great War.